Looking for a baby Aldabra tortoise for sale? We’ve got the nicest Aldabra giant tortoises for sale anywhere! Looking for a Giant Aldabra tortoise for sale? Tortoise Town has the NICEST baby Giant Aldabra tortoises for sale anywhere in the world! Our baby Giant Aldabra tortoise for sale are raised with perfect humidity, diet, and care and have perfect bowling ball smooth shells. Most imporantly, Aldabra tortoises and are some of the coolest little, soon to be bigggg Dinosaurs alive on planet earth! The Aldabra Giant tortoise for sale is a truly a special creature. If you’ve got the room, and the time to invest in learning and providing proper care, an Aldabra Giant tortoise for sale could be for you. You see, an Aldabra tortoise will be the most amazing reptile you will ever own. Be sure to check out our fantastic Aldabra tortoise care sheet in our Aldabra tortoise care section. In addition to the Aldabra, our Aldabra tortoise care section also features information on Galapagos tortoise for sale. Galapagos tortoises are giant tortoises! Like the Galapagos tortoise, the Giant Aldabra tortoise for sale really is a gentle giant and a true connection between modern times and dinosaurs that once roamed our planet. Those considering adding Aldabra tortoises to their reptile family, please spend some time researching proper care. In addition, if you have the room, these are some fantastic animals who will reward you and your family for decades and generations to come. Tortoise town only works with 100% captive-bred Giant Aldabra tortoise for sale and Aldabra Giant tortoises for sale. The Aldabra giant tortoise comes to us from the islands of the Aldabra Atoll in Seychelles. 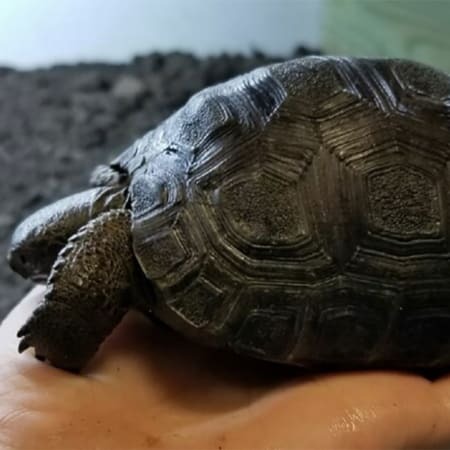 Tortoise town has just a few super cute CAPTIVE BRED baby Aldabra giant tortoise for sale available in hatchling, 6-month-old well started baby, and yearling sizes! (also known as Aldabra giant tortoises for sale). Our Aldabra tortoises are perfect scute, bowling ball smooth, excellent specimens that we are extremely proud of. Secondly, these cute 4-6″ baby Aldabra tortoises are eating a variety of calcium dusted greens. In addition, our Aldabras enjoy mazuri tortoise chow, squash, zucchini, a variety of weeds and Opuntia cactus. Besides offering baby Aldabra tortoises for sale, we also offer and always recommend the 6-month-old well started Aldabra tortoises for sale. In addition to babies, our customers often choose yearlings over the more fragile baby giant Aldabra tortoise hatchlings for sale. As the 2nd larger tortoise on the planet, an Aldabra tortoise is fairly easy to care for when compared to most other species of tortoise for sale. The best place to buy a baby Aldabra Giant tortoise for sale or any tortoise for that matter is Tortoise Town! When customers choose any tortoise it is important that you purchase a healthy animal from an experienced tortoise breeder. Captive bred Aldabra Giant Tortoise for sale, or Aldabra Giant Tortoise babies for sale should be purchased over wild-caught animals. Most importantly, our Aldabra Giant Tortoise for sale are top notch and ready to ship to you via UPS or FedEx Overnight. Secondly, our customers’ tortoises are shipped in heated or cooled, insulated shipping boxes and come with our live arrival and full 7-day health guarantee. One shipping charge covers up to 4 tortoises. Be sure to check out our Aldabra tortoise care section for more information on caring for these amazing giants! Remember when searching for any tortoises for sale, including a new baby tortoise for sale, tortoise town is your source for the best tortoise for sale. Secondly, TT offers a wide selection of, baby tortoises for sale , baby turtles for sale, and adult turtles for sale. Lastly, TT has a full selection of water turtles, including aquatic turtles for sale, of any turtle store anywhere. Be sure to build a proper Aldabra tortoise habitat before your baby comes home! An outdoor enclosure is highly recommended when conditions allow this. The above dimensions apply but the more space that can be provided the better. Environment: The Aldabra Giant tortoise for sale seems to tolerate a large range of conditions but a warm stable environment is recommended. An Aldabra Giant tortoise for sale should have a hot spot of at least 100F and a cool section of no less than 75F. Most importantly, a heated hide box should be at least 82F. You can attain this by fixing a heat emitter to the ceiling of the hide box. Lamp wattage of the heat source is going to be determined by the insulation of the hide box and the surrounding temperature. A UV source is a must if you cannot provide daily exposure to natural sunlight. For this a self-ballasted mercury vapor lamp is recommended. Using the right Tortoise UVB lamp is most important! A popular example of this is the Active UV Heat lamp, which is now distributed by several dealers with T-Rex being one of them. Humidity can be provided by moistening the substrate of the hide box but does not seem to be necessary. It is presently suspected that a humid microhabitat is beneficial in good shell development. Aldabras like to soak So, if possible, try to provide a ‘mud hole’ in its outdoor enclosure. Feeding: Aldabra Giant tortoises for sale are grazers for the most part but seem to be opportunistic when the situation arises. In a word… these guys are pigs and will eat anything. This particular group is fed mainly grasses and broadleaf weeds (read: lawn clippings when the lawn is mowed) in addition to grocery greens including Romaine, Escarole, Endive, Green leaf, Red leaf, Kale, Collard greens. When these are fed, it is in a ratio of 2 to 1 (lettuces to the other stuff). The greens are fed every 2 to 3 days. Fruits such as Apple, Pear, Strawberries, Kiwi, Mango and occasionally Mellon are fed as a treat. Not too much concern is given to feeding the Apples and Berries and such. The high moisture content foods are fed with caution. On the days in between, Mazuri tortoise diet is fed. (It can be purchased from our tortoise food section) . If you are interested in a different species of baby tortoise for sale, or adult tortoise for sale, check out all of our tortoises for sale here. In nature, you’ll find Aldabra Giant tortoises are found on the islands of the Aldabra Atoll in Seychelles. Interestingly, the Aldabra one of the largest animals as well as tortoises in the world. To date, the largest tortoise on record being the Galapagos tortoise – Geochelone nigra). Aldabra tortoises have a varied habitat on their home and introduced islands, ranging from mangrove swamps and coastal dune areas to grasslands and scrub forests. You can find Aldabra tortoises for sale at select reptile stores, reptile shows and sometimes on the Internet. If you are able to find one, no doubt you will find them very rewarding to keep. Aldabra tortoiselong-lived lived gentle giants, some giant Aldabra tortoises for sale having reached more than 200 years of age. According to history, the oldest known Giant Aldabra in captivity at the time of this writing is 170 years old. Consider that your new baby Giant Aldabra tortoise will start off small but grow anywhere from 1-6 inches per year! Aldabra tortoises are mostly herbivores however they are also opportunistic feeders. In nature they eat grass, leaves, plants, stems and other tasty weeds. They will also feed on insects and dead animals, even their own kind. In captivity they will eat grass, flowers, cactus pads, all sorts of leafy greens and commercial tortoise food. They also like fruit and melons. Keeping Aldabra tortoises outdoors is usually the best way to house them. Hatchlings up to 2 years old can be housed indoors, but once they get beyond that, they need the great outdoors to roam. For babies up to a year old, tortoise tubs or the equivalent work very well. Use bark or crushed coconut for the bottom of the enclosure. Lastly, provide a hotspot of about 90 degrees Fahrenheit at one end of the enclosure with an ambient temperature of about 80 degrees. Mercury vapor lights work well for this, as they provide both UVB and heat all in one fixture. Most importantly, understand that UV and the proper temperature is key to successfully keeping your new Giant Aldabra. Aldabra tortoises can be a breeze to care for once your new Aldabra tortoise for sale iscomfortable. Keep in mind that Aldabra tortoises for sale grow super large, so as a rule of thumb, the larger the outdoor Aldabra tortoise habitat, the better. Most of the time, Giant Aldabra tortoises spend the mornings and early evenings eating. It’s most common to see them spending the hotter parts of the day in the shade or lounging in shallow water holes. In contrast to other tortoises, Aldabras are deceptively quick when they want to be. As hatchlings, an and will actually sprint away if frightened. If they think you have a treat for them they will sprint right to you. Artificial incubation works best. However, if you incubate the eggs at between 81 to 86 degrees, they will usually hatch in less time, about 90 to 108 days.